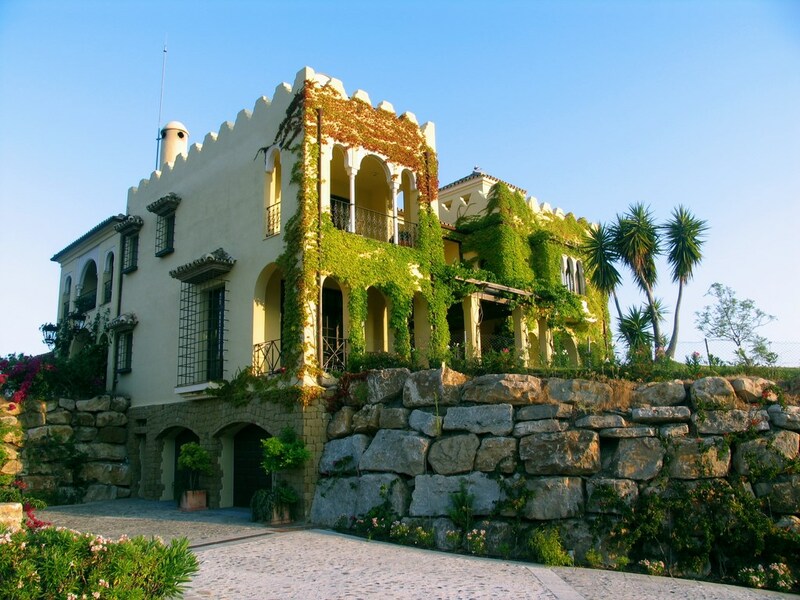 We have all heard of Al-Andalus and the nearly 800 years of Arab influence in the Iberian Peninsula, so we knew that, sooner or later, a modern property which harks back to the Moorish glory days in Spain just had to turn up. And, here it is…. in the Marbella Golf Club Resort!! Beautifully located within the prestigious Marbella Club Golf Resort (the Golf Course and Equestrian centre for the 5-star Marbella Club and Puente Romano Hotels), this property sits in a commanding elevated position above the 18th tee, looking all the way down the last fairway to the clubhouse lake, and offers breathtaking 360º views from the Benahavis foothills to include additional manicured golf fairways and greens towards Gibraltar and North Africa, and the Moorish fort (that inspired the design of the house) sitting against the beautiful mountain backdrop. 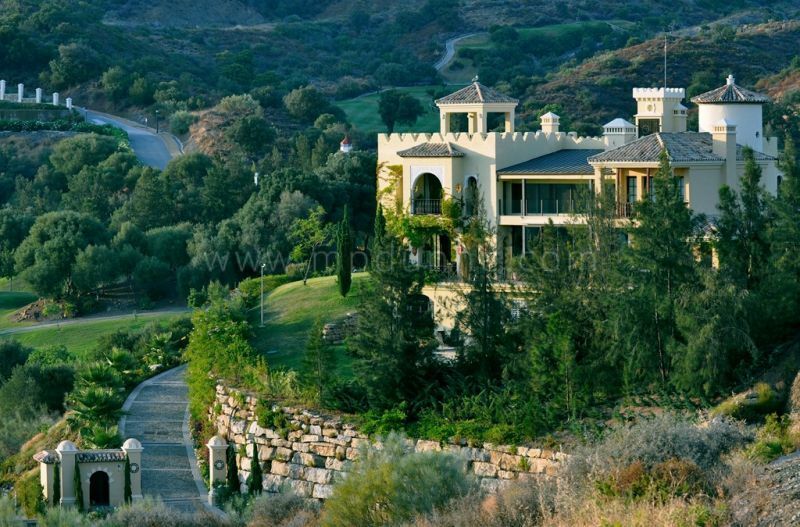 Many would agree that this is the best plot of all – it even has its own buggy access to the golf course! This is a home that offers the utmost privacy within a gated, 24-hour secure community, but at the same time has easy access to the coast via the Benahavis road, and west to Estepona via the Cancelada road. This unique 5-year old villa subtly blends Moorish charm with contemporary living accommodation which is distributed over 3 floors. Designed and built by the current owner to exact specifications, no expense has been spared to achieve the high-level attention to detail presented throughout this exquisite family home. A great sense of space and tranquillity can be felt throughout the property. All floors are serviced by both the marble staircase and the elevator. Special features include a central atrium which is flooded with natural light from a sliding glass roof whilst at the same time allowing cooling air to flow through over the inside/outside pool during the summer. The house is fully air conditioned, and each room has under floor heating, controlled locally and centrally from a smart computerised system. An imposing sliding gate opens onto the sweeping driveway which leads directly up to the main entrance of Casa Morisca, and where parking facilities include a 3-car garage and outdoor parking area for an additional 6 vehicles. 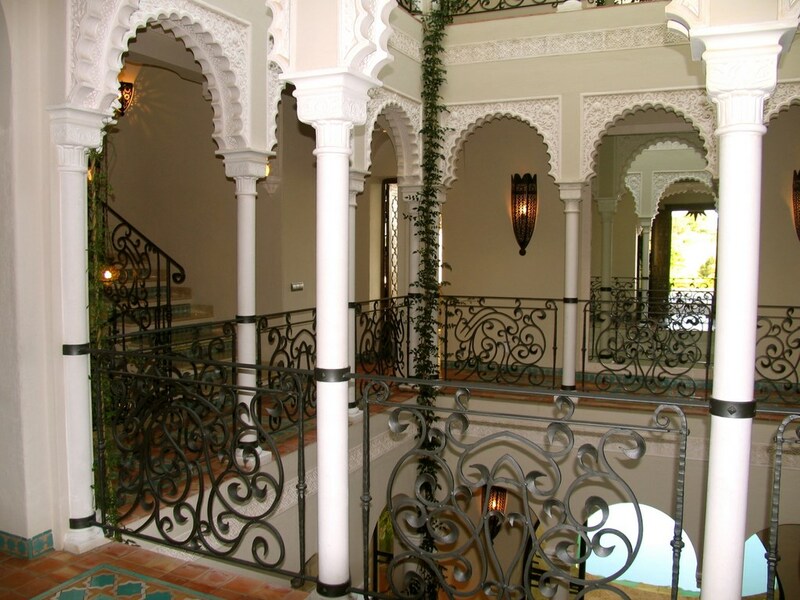 Once inside the house, one can feel the Moorish atmosphere thanks to a classy blend of architectural details, furniture and furnishings. The ground floor offers a bespoke fitted kitchen with dining area which leads out onto a covered terrace complete with BBQ which has been cleverly installed under a flue chimney to make “al fresco” dining a more enjoyable experience. A snug to the side of the kitchen diner serves as an informal TV room or children’s play room. A separate W.C. and wash room compliments this area. 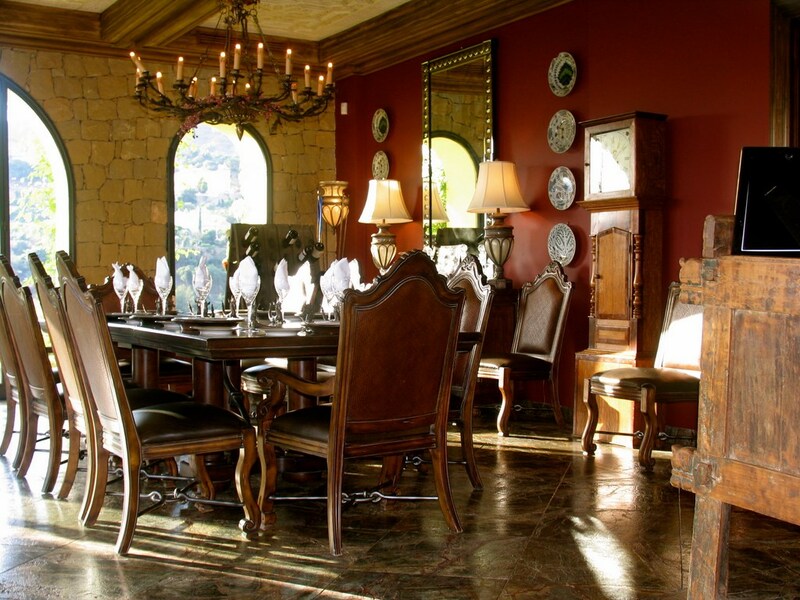 The formal dining room seats up to 20 people and retains a very Moorish feel. It leads directly onto a large terrace through floor-to-ceiling sliding steel doors from where unrestricted west-facing views towards Gibraltar and North Africa can be enjoyed to the full. Also with floor-to-ceiling sliding door access to the terrace is the large vaulted sitting room where a lovely working fireplace is the major focal point. To the side of the living room is a study. Beautiful scored Indian marble floors are to be found thoughout this level. The first floor has both staircase and lift access and offers 5 huge double bedrooms, each with en-suite bathroom and large terrace with open views. The roof terrace provides both covered and uncovered areas, a kitchenette and dining space. From here, again there are 360º unrestricted views. To maintain the Moorish feel to the property, a striking copper roof was installed. The lower ground floor is currently being used by the owners as 2 completely separate apartments with a fully fitted kitchen. This area is ideal for guests or for use as staff quarters, with the added advantage of having an independent entrance which ensures privacy. A games room and cinema room are also on this level and it receives plenty of natural light. 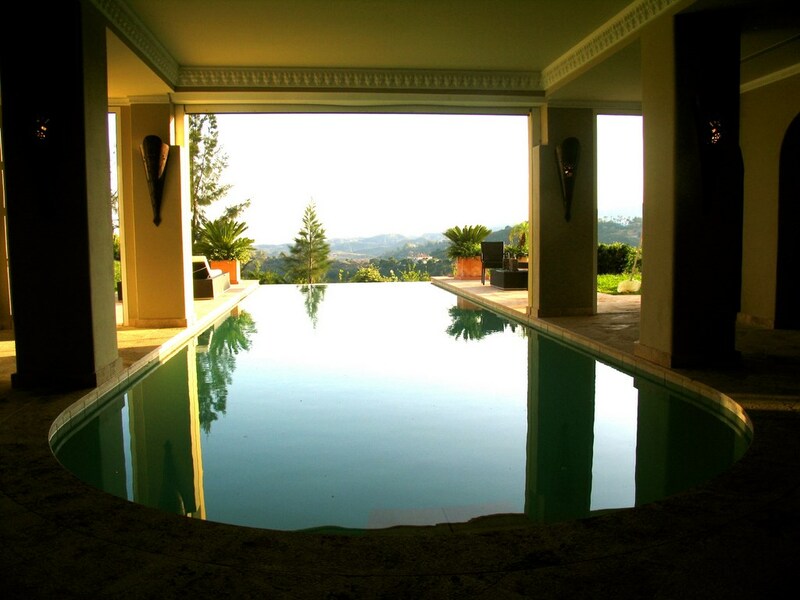 The property boasts an indoor/outdoor heated infinity pool surrounded by Travertine non-slip marble, with changing room and facilities. Solar panels glide effortlessly away at the touch of a switch and low level flood lighting adds a touch of exotic elegance to this area. 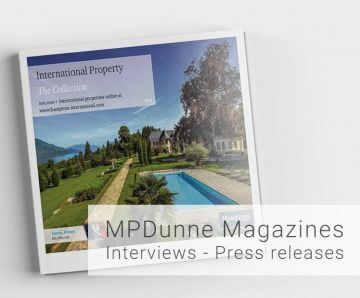 With just over 5,000 square metres of gardens and lawns, shrubs and lovely orchard walk, this property really has to be viewed in order for all its magnificent features to be appreciated to the full.